SEONGNAM, South Korea, Oct. 29 (Yonhap) — Gyeonggi Province Gov. Lee Jae-myung faced police questioning Monday over mounting allegations involving his family and extramarital affairs. 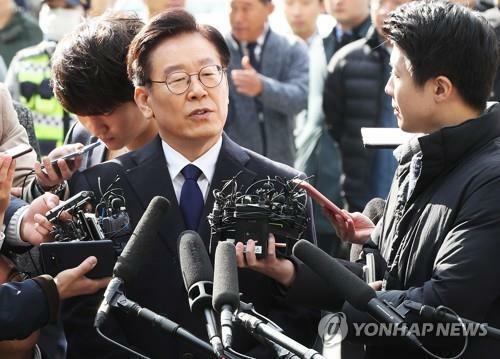 Lee arrived at the Bundang Police Station, south of Seoul, at about 09:50 a.m. Lee’s office announced last week the governor had agreed with the police to undergo the questioning. Lee left the station at about 8:25 p.m. The influential politician has long been dogged by allegations involving his family and an actress who claims to have had an affair with him. In June, the minor Bareunmirae Party filed a complaint against him, alleging that he used his mayoral power to have his brother, now deceased, hospitalized against his will and that he violated the election law by denying the suspicion. After the end of his questioning session, Lee told reporters that it was his sister-in-law who pushed Lee’s brother into the hospital. The party also claimed he lied during his campaign for governor about his alleged affair with the actress and pressured local companies to provide more than 16 billion won (US$14 million) to the city-affiliated pro football team in the form of advertisement charges. Lee, who is affiliated with the ruling Democratic Party, became the governor of the province surrounding Seoul after winning a heated election in June. Lee was also a contender in the party’s presidential primary last year. Police officials said Lee only answered questions regarding his brother’s forced hospitalization, and chose to submit prepared statements when pressed about other allegations. They also said Lee refused to return for another round of questioning.